The Meadows senior Anjali Daulat returns the ball during a Division I-A state championship match against Faith Lutheran. Daulat and the Mustangs won, 12-6. 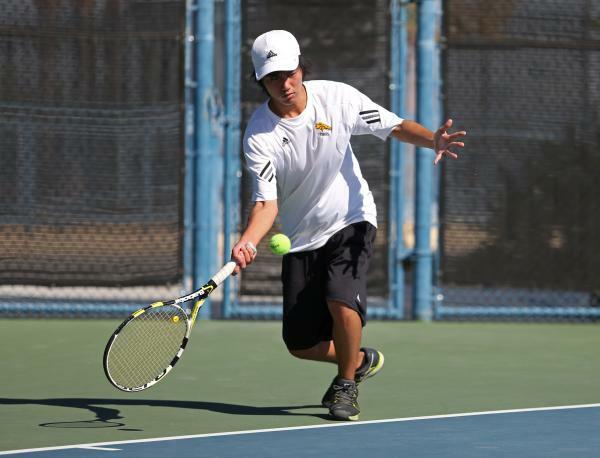 Clark junior Andrew Lim returns the ball during a Division I-A state championship match against Truckee on Friday. The Meadows senior Anjali Daulat returns the ball during a Division I-A state championship match against Faith Lutheran on Friday. Clark senior Deric Pang returns the ball during a Division I-A state championship match against Truckee on Friday. 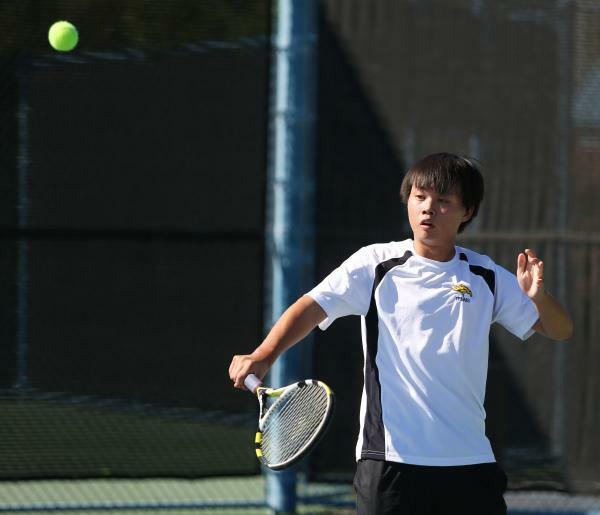 Clark junior Andrew Lim serves during a Division I-A state championship match against Truckee on Friday. Faith Lutheran freshman Madison Foley returns the ball during a Division I-A state championship match against The Meadows on Friday. 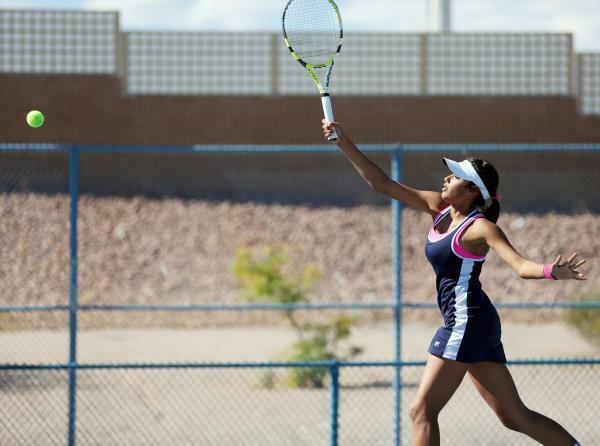 The lone senior on The Meadows girls tennis team, Daulat was tasked with leading a squad that lost four big contributors from last year’s Division I-A state championship team. She couldn’t have done a better job. 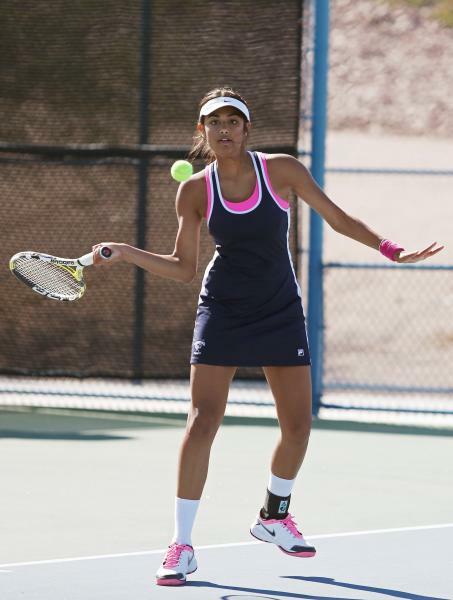 Daulat went 3-0 in singles to help the Mustangs to a 12-6 win over Faith Lutheran in the Division I-A final Friday at Darling Tennis Center. The Mustangs’ starting lineup Friday had one junior, five sophomores and two freshmen to go along with Daulat. Daulat had plenty of help. Shalini Shah and Shayley Shimkus went 3-0 in doubles, and Abbigail Klein and Anuja Daulat each went 2-1 in singles for The Meadows (18-1), which also got a 2-1 effort in doubles from Ava Frazier and Samantha Gondy. Frazier and Gondy won a key second-round set, downing Rachel Taber and Chandler Young, 7-5 to give the Mustangs a 7-5 lead after two rounds. 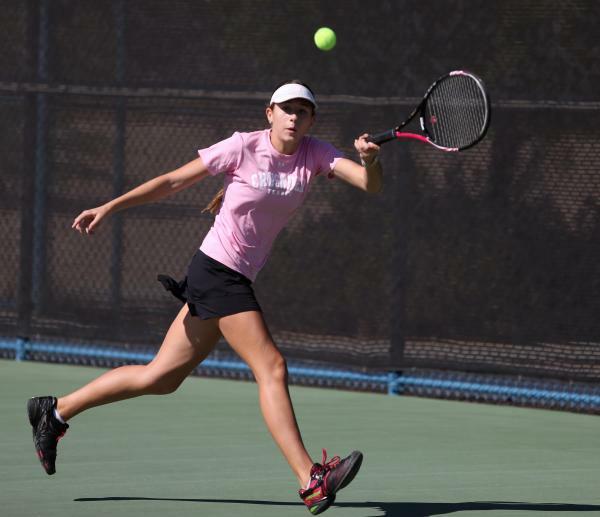 Madison Foley was 2-1 in singles, and Lauren Wright and Talia Graf were 2-1 in doubles for Faith Lutheran (17-5), which went 0-4 against the Mustangs this year. Clark’s boys waited 33 years before breaking a state title drought last season. The Chargers wasted no time achieving more glory. 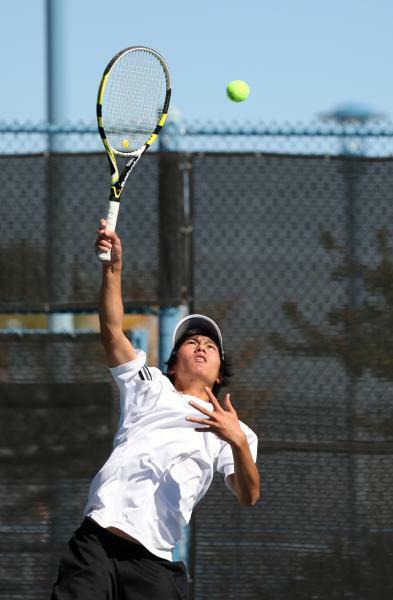 Miko Pasimio and Deric Pang each went 3-0 in singles, and the Chargers successfully defended their Division I-A title with a 12-6 win over Truckee. 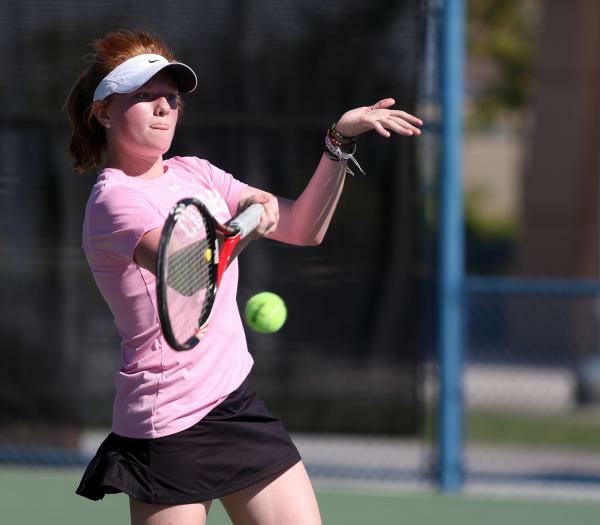 The Chargers won seven of the nine singles sets and built a 9-3 lead after two rounds to remove any doubt. Clark (17-0) was an 11-7 winner over Truckee last season, and hasn’t lost since. The Chargers haven’t scored fewer than 12 points in a full match since last year’s final. “When you win that first state title in so many years, it kind of attracts winners, and that’s what it did,” Chun said. Chaitanya Ingle and Marcus Pasimio were 2-0 in doubles for Clark, which got at least one point in all six lineup slots. The doubles teams of Colin Gerrard and Teagan Pado, and Aaron Deeter and Ethan Gotts both went 2-1 for the Wolverines.